Alexander conquers Persia - After his father was assassinated in 336, Alexander became king and inherited the army that Philip had built. He launched his invasion of Persia two years later in 334 B.C. by crossing the Hellespont into Asia Minor. His army consisted of close to 50,000 infantry, 6000 cavalry and 120 ships, manned by 38,000 crewmen. The Persian army met him at the river Granicus. Alexander's expedition might have ended before it even began. Although the Macedonian army routed the Persians, Alexander was nearly struck down while crossing the river; but his cavalry commander, Cleitus (the Black) saved him in time. The provincial capital of Sardis surrendered and Asia Minor was his, along with all its wealth. From there he traveled down the Ionian coast conquering those towns that resisted, though most didn't put up a fight. Then turned east and reached the Phrygian capital of Gordium. It's here that he encountered the "Gordian Knot", which legend stated that the rule of Asia would go to anyone who could "loose" it. Alexander studied it and after a few minutes of thought, drew his sword, proclaimed that the legend did not say how the knot had to be undone, and proceeded to hack it to pieces (he was king, who was going to question him?). In 333, he met Persian King Darius III for the first time at the Battle of Issus. He surprised Alexander by marching his army north and cutting off the Macedonians' supply line. It was also about twice the size of Alexander's. This simply meant that the battle was close...for awhile. Darius attacked Alexander where his army was weakest, his left phalanx, and initially gained the upper hand. But Alexander was a master of tactical adjustments. He reinforced the phalanx with his cavalry, which he led himself. In the end, the battle turned into an overwhelming victory for Alexander. Darius fled the battlefield. His wife, two daughters and mother, all of whom attended the battle, were captured. Now the Levant was open to Alexander with nothing to oppose him. He made his way down the Mediterranean coast adding each city to his growing empire. But one famously resisted. The ancient city of Tyre (ancient even in Alexander's day. See Tyre & Sidon on the Phoenician timeline). It lay a half-mile off the coast on an island and was protected by a strong wall. The Tyrians confidently rejected Alexander's demand to surrender. He responded by building a half-mile long causeway from the mainland to the island. In 332, his men breached the wall and conquered the city. For their defiance, Alexander killed the adult males and sold the women and children into slavery. While the siege of Tyre was underway, King Darius sent a message to Alexander offering to pay him 10,000 talents of gold for the return of his family, and ceding all lands west of the Euphrates River to Alexander in exchange for peace. One of his generals, Parmenio, said he would accept the offer. Alexander famously responded, "I would too, were I Parmenio." The offer was rejected. One of the more interesting stops on his campaign was in Jerusalem. 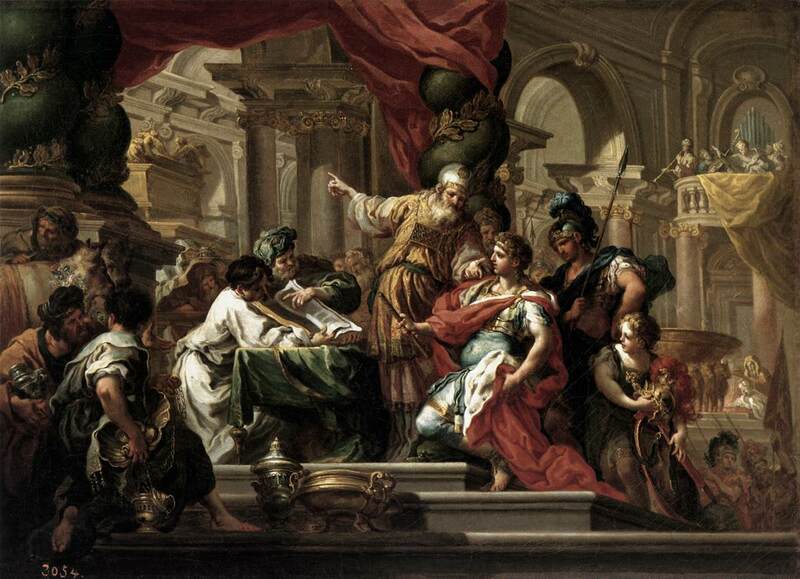 According to Josephus, Alexander left the city alone when the high priest showed him the Book of Daniel foretelling that the kingdom of Greece would overthrow the Persian Empire (Antiquities of the Jews, Book XI, chapter 8). After a stop in Egypt where he built the city of Alexandria (see Alexandria), he was on the move again. The climatic battle came on October 1, 331 B.C. at Gaugamela (or Arbela). Darius knew this would be the decisive battle and conscripted troops from every corner of his empire. He amassed a huge army of over 200,000 infantry and 40,000 cavalry. By contrast, Alexander had a force of 47,000 infantry and 8,000 cavalry. But Alexander's army was battle hardened. Darius also chose a flat, open battlefield on which to fight in order to utilize his superior chariot numbers; chariots which he outfitted with blades on the wheels to cut down the Macedonians. None of these advantages did the Persians much good. The tactics of the battle are complex and confusing. Simplified, the Macedonians formed a wedge in the center of their line and smashed through the Persian line to make a play directly for Darius himself. Alexander used his cavalry to create a gap in the line through which his infantry marched. He knew that striking the commander of the army was the key, particularly in light of the fact that most of the Persian soldiers were inexperienced warriors. The strategy worked as planned. Darius panicked and fled the battlefield (again). The Persian line collapsed and Alexander won another decisive victory. A short time later, Bessus, the Persian cavalry commander murdered Darius and fled East. This brought about an end to the Persian Empire. All the Persian satraps swore loyalty to Alexander and he allowed them to retain their positions. The Persian Empire had become Greek.